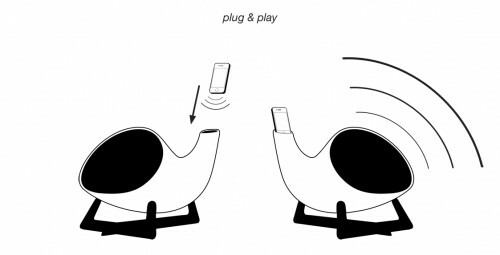 Tis The Megaphone Your iPhone's Been Waiting For | OhGizmo! 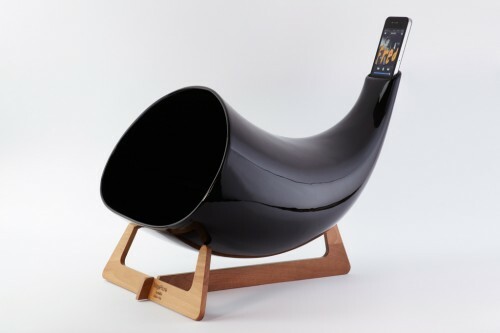 This… now this is sure to get you some conversations. 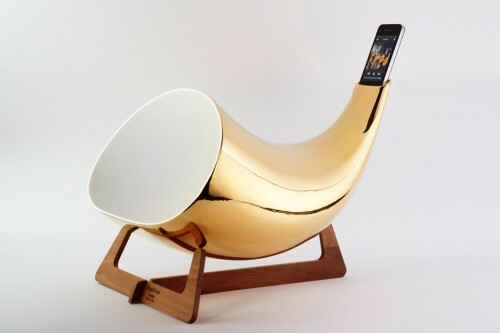 It’s a passive ceramic amplifier made specifically for the iPhone. 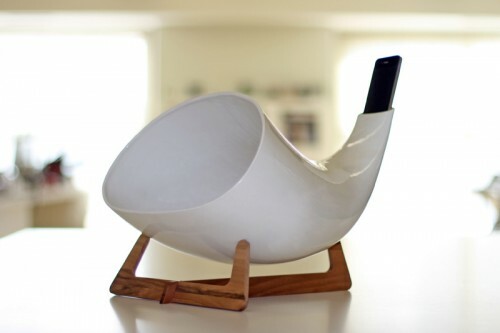 As you can plainly see, it’s in the shape of a horn and contains a docking area at the top that will fit your Apple music device snugly. 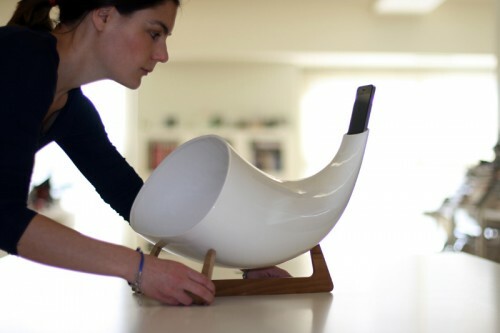 As musical horns do, the MegaPhone will amplify the sound coming from the iPhone’s speakers due to the specific shape of its walls. 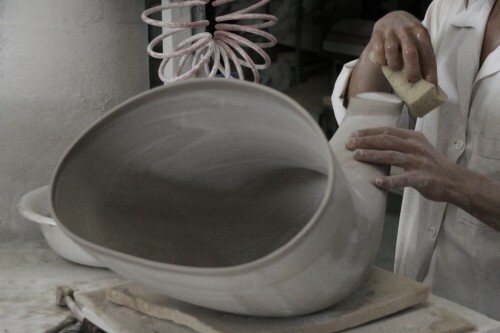 It also rests on a thin wooden structure which is meant to raise it above any surface and allow it to vibrate more freely. We’re not sure if the video below is really representative of the level of amplification, but really, it doesn’t matter: it looks awesome. 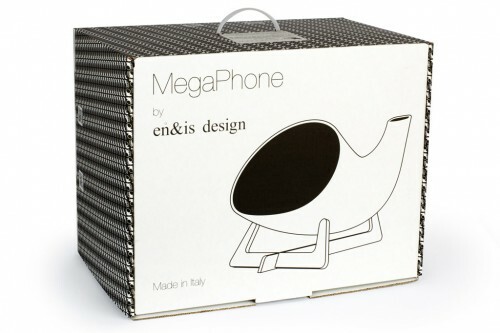 The MegaPhone is compatible with iPhone 2G, iPhone 3G, iPhone 3GS, iPhone 4, iPhone 4S and costs 400 Euros. 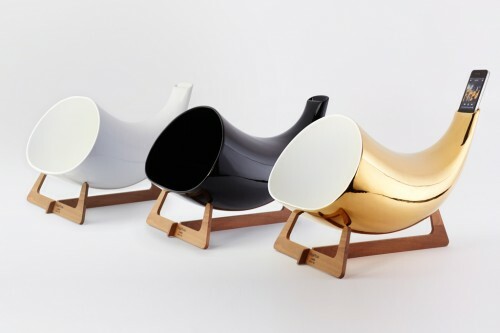 That’s for the black or white version, while a gold plated model will set you back 600 Euros. Hit the jump for a bunch more pictures and links.